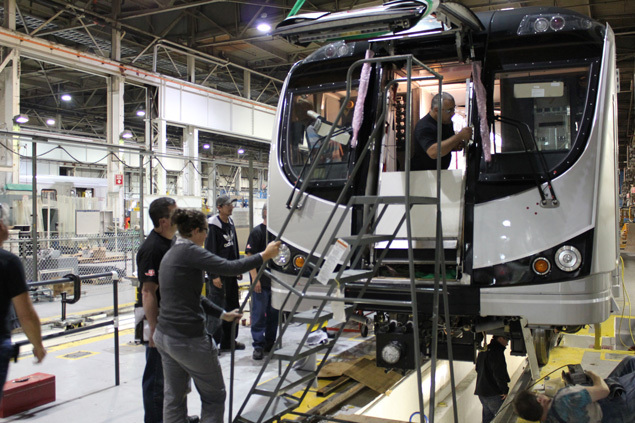 THUNDER BAY – The City of Toronto is getting their first look at the new Bombardier Rocket manufactured in Thunder Bay. Lisa Raitt, Minister of Labour; the Honourable Kathleen Wynne, Ontario’s Minister of Transportation, His Worship David Miller, Mayor of Toronto, and Toronto Transit Commission (TTC) Chair Adam Giambrone, will unveil the new Toronto Rocket. Claude Gingras, the General Manager at Bombardier Thunder Bay stated, “This facility is almost 100 years old now, and always trying to stay one step ahead of the pack.” Gingras adds, “The technology is much more advanced, for our customers”. CAW Local President Paul Pugh stated, “I don’t think I can over emphasis how important this contract is, it is huge for both the workforce and the city. I think the thing I am most proud of is without a plant like this, the Thunder Bay economy would be in big trouble today”. City of Thunder Bay officials, and provincial MPPs are expected to comment on today’s unveiling later today.